The Second Annunciation, sometimes known as The Announcement of the Virgin's Death, is a relatively rare image in art, but when it does appear it is easily confused with true Annunciation images. The main difference is that Mary is shown as much older, and is dressed as is appropriate for a married woman. And on a day, when all the apostles were spread through the world in preaching, the glorious Virgin was greatly filled with desire to be with her son Jesus, and she wept copiously because she could not bear to be without the comfort of her son. And an angel came to her, surrounded with great light, and saluted her honourably as the mother of the Lord, saying: All hail blessed Mary, receiving the blessing of him that sent his blessing to Jacob. See here a bough of the palm of paradise, Lady, which I have brought to you, which you will command to be carried before thy bier. Your soul shall be taken from thy body three days from now, for your son is waiting for you, his honourable mother. Mary answered: If I have found grace in your eyes, I pray that you tell me your name, and I pray also that my sons and my brothers the apostles may be assembled with me, so that before I die I may see them with my own eyes, and be buried by them, so that I may yield up my ghost to God in their presence. And also I pray that my spirit, leaving my body, does not meet any wicked spirit or fiend, and that no power of the devil will come against me. And then the angel said: Lady, why do you desire to know my name, which is great and marvellous? All the apostles shall assemble this day, and shall honour you at your passing, and in their presence you will give up your spirit. For he that brought the prophet by his hair from Judea to Babylon, will for certain bring the apostles to you here. And why do you fear the wicked spirit, when you have broken utterly his head, and have removed him from the empire of his power? Nevertheless your wish shall be granted, and you shall not see the fiend. Then the angel mounted into heaven with great light, and the palm shone brightly, like a green branch whose leaves shone like morning stars. In Legends of the Madonna Anna Jameson tells of an old French legend that identifies the angel with the Archangel Michael, the archangel associated with death. 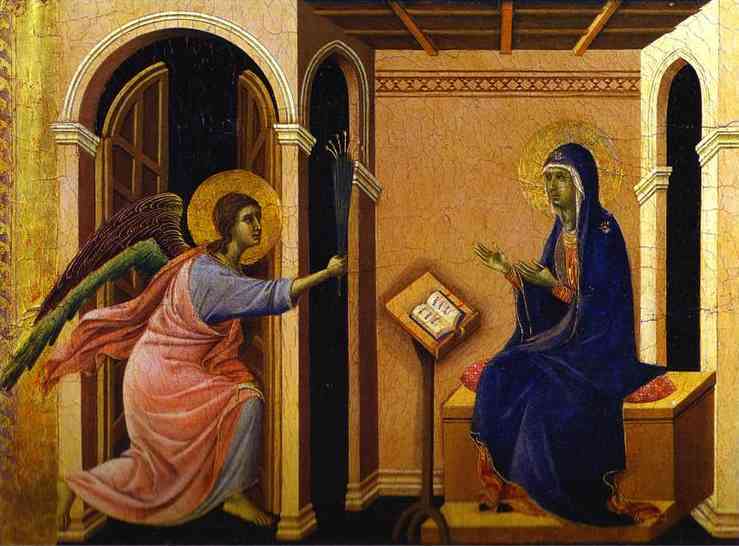 One of the best known versions comes from the Maesta of Duccio. When first painted, the shining palm must have matched the description in the Golden Legend, but it has blackened. 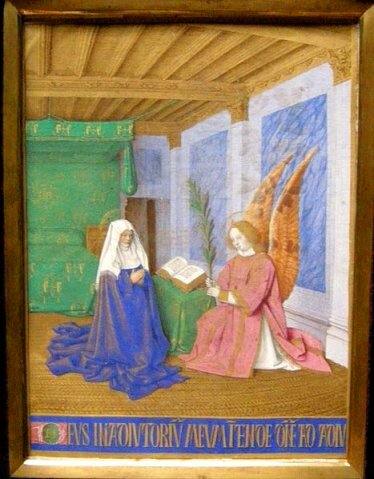 In the version below, by Jean Fouquet from The Book of Hours of Etienne Chevalier, the palm has retained its colour.